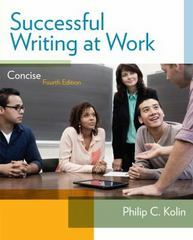 Successful Writing at Work 4 Edition Packed with real-world examples, SUCCESSFUL WRITING AT WORK: CONCISE, 4e delivers a practical yet succinct introduction to effective workplace writing for a variety of communication tasks. Based on the market-leading SUCCESSFUL WRITING AT WORK, 10e, the CONCISE edition covers the most essential skills for effective workplace communication. The text begins with writing basics, emphasizing the characteristics of effective writing, the writing process, ethics, and the importance of audience. It covers basic business correspondence, walks students through formatting letters for a variety of business situations, and features a step-by-step chapter on getting a job. More advanced chapters focus on document design and visuals, writing instructions and procedures, writing reports, proposals, and making business presentations. The Fourth Edition emphasizes ethical considerations throughout as well as integrates guidelines for greening the workplace.